Over 180 people attended this event. Although we almost ran out of chairs and a last-minute thunderstorm threatened to drown out the opening remarks, once Mr. Dale took the stage, led by interviewer Neil Hickey, the evening came alive with anecdotes of show business survival, the making of the Harry Potter audio books and lessons on comedy illustrated by excerpts from the British series of Carry On films. Calculations still need to be made, but this outpouring of support for Mr. Dale and Arts on the Lake has been gratifying. It helps us continue classes, concerts, plays and exhibits at the Center on Lake Carmel. 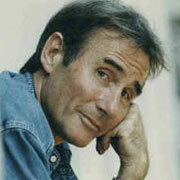 Jim Dale - of Broadway, film, TV and Harry Potter fame - will present his one man show at the Sedgewood Boathouse* as a fund-raiser for the arts in Kent. Introduced by journalist Neil Hickey, Mr. Dale will review his varried and extraordinary past fifty-five years in show business. This special evening, with light refreshments and a chance to socialize, will begin as the sun sets behind the hill overlooking China Pond in Western Kent. Still Carrying On will include excerpts from the Carry On films made early in Mr. Dale's career. We encourage supporters to be as generous as possible. A tax-deductible contribution of at least $30 per person is requested. Admission may be secured at Buy Tickets above. Or a reservation may be made by email to rsvp@artsonthelake.org. *The Sedgewood Boathouse is handicapped accessible. Its address (for MapQuest and Google Maps) is 1026 Barrett Circle West, Kent, NY 10512. Arts on the Lake thanks the Sedgewood Club for supporting the arts in Kent. 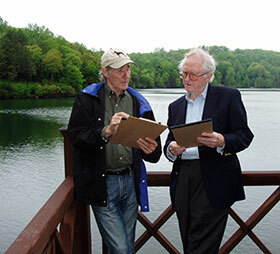 Jim Dale (left) and Neil Hickey on the Sedgewood Boathouse deck checking notes for the June 5th benefit. At the age of seventeen, Jim became the youngest professional comedian on the British music hall stage. At twenty-two he became a successful pop star under the wing of legendary Beatles recording manager Sir George Martin. In 1970, at the request of Laurence Olivier, he joined The British National Theatre. In 1974 he starred on Broadway in Scapino. In the category of â€œBest Actorâ€ he won a Tony Award for Barnum, plus five Tony Nominations, four Drama Desk Awards and four New York Critics Awards. His work includes Me and My Girl, Joe Egg, Travels With My Aunt, Privates On Parade, Candide and The Threepenny Opera. He starred in twelve of the British Carry On films, and was nominated for a BAFTA Academy Award as â€œBest Newcomerâ€ for his leading role in Adolf Hitler â€“ My Part in His Downfall. He won an Oscar Nomination for writing the lyrics for the song "Georgy Girl". To millions of children and adults Jim is the voice of Harry Potter. He has recorded all seven books in the series, winning a record ten Audie Awards, including â€œAudiobook of the Year â€“ 2004â€ and â€œBest Childrenâ€™s Narratorâ€ 2001, 2005, 2007 and 2008. Last year he accepted his second Grammy Award. He also holds two Guinness World Records: one for creating 146 different voices for Harry Potter and the Order of the Phoenix and his second for â€œOccupying the First Six Places in the Top Ten Audiobooks of America and Canada.â€ In 2005 he became the first inductee into the Audio Hall of Fame and this year he was inducted into the American Theatre Hall of Fame. In 2003 Queen Elizabeth II awarded Jim the MBE (â€œMember of the Order of the British Empireâ€).